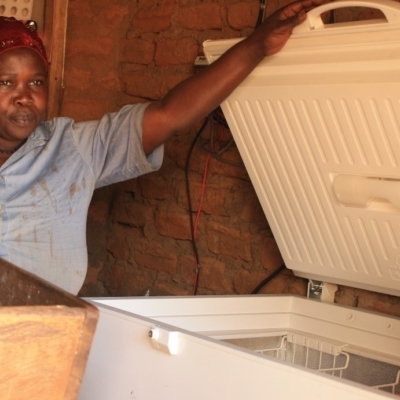 The Global LEAP Off-Grid Cold Chain Challenge and UK Aid announced 10 finalists to deploy their energy-efficient, sustainable, and cost-effective technologies that can meet the cold storage requirements for agricultural produce and dairy products. The finalist companies are Coldhubs, DGrid Energy, Ecolife, EcoZen Solutions, FreshBox, InspiraFarms, Inviro Choice Solutions, SunDanzer, The Off Grid Factory, and Tiger Power. The Off-Grid Cold Chain Challenge (OGCCC) received 28 nominations over a three month period. Fourteen expert judges evaluated the entries based on financial viability, potential end-user impact, understanding of the product’s target market and overall sustainability. Finalists will receive 5,000 GBP with the remaining 5,000 GBP contingent on product deployment in one of 11 target countries over the course of the next two months. Showing significant geographical diversity, the OGCCC received nominations from 12 countries across five continents. The finalist units are solar powered and each includes chemical or thermal storage technology. Most of the finalists expect their products to be used by multiple smallholder farmers or market vendors selling perishable produce like fruits and vegetables on a pay-per-use basis. Winners will be announced in July 2019. The OGCCC is a part of the Ideas to Impact program, which is funded by UK Aid delivered by DFID and implemented by an IMC Worldwide-led consortium. Ideas to Impact has designed and runs prizes to stimulate innovative solutions to climate change adaptation and access to energy, water, sanitation and hygiene. OGCCC is also supported by Power Africa’s Beyond the Grid initiative.